This is becoming a cause for concern. Ah yes. Joe talks to angels. How do you know? Would a man who talks to angels tell a lie? The logic is impeccable. Great strip. How does he read that…Oh! Never mind. According to the old adage: It takes one (in this case: two) to know one. 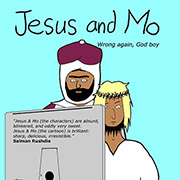 It’s obvious that Joe LOVES Jesus and Mo equally. Afterall, he’s treating them the same way he treats his wives……. 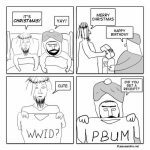 A real test for Jesus and Mo would be if Joe asked for a ham and cheese sandwich, for god’s sake, that’s a poke in the eye of Kosher and Halal laws. @jerry w: Right, the ham-and-cheese really is a missed opportunity. Not sure about the Mor(m)ons’ dietary idiosyncrasies, though. ham and cheese sandwich was a golden opportunity. Looks like J & M are going to have to get bigger bed soon. I’m agree with Jerry w and European. Shouldn’t Mo have been the one to give Jim the foot bath? Just sayin’…. To be fair to Joe, that is Mo’s old Wife Collector magazine. The one with the special pre-teens bargain selection. @kikainonakanoyuurei: we alteady know that the bed takes at least three, even though it doesn’t look it. great strip!!! cartoonists from J&M you guys rock!!! @Stephen Turner ~ LOL ~ thanks, I must have missed that one! Will have to see if Moses shows up, after all he is the one who recommended Joe to J & M ~ then it could get REALLY cozy ne? Again, great strip!!! My in-laws are all LDS, so I’m getting special satisfaction out of the recent Hat-Face strips. Keep them coming Author! Isn’t it hilarious when the blind are so confident they can lead the blind? See if you can get them to trade one form of idiocy for another, at least it’s a start lol. Joseph Smith is my hero! Matt and Trey (2 of my real heroes unlike the rubbish I spouted above), the makers of South Park have made their first ever Broadway musical called ‘The Book of Mormon’. I live in the UK but would so love to see it. If any of my fellow readers live in NY and would like to see Joseph Smith being mercilessly made fun of, please go to watch it and let us know what it’s like! Didn’t Jesus declare the dietary proscriptions of Leviticus obsolete with the invention of his new covenant? Meaning (as interpreted by the Pauline tradition, at least) that there is thereafter no distinction between clean and unclean foods for Christians, and their religion is no longer just a sect of Judaism but is open to gentiles too. Guess that means it will always be Jesus’ turn to make the ham sandwiches!